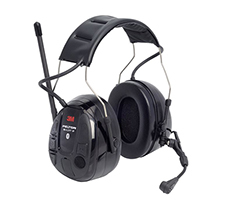 3M™ PELTOR™ Headsets are the workers’ choice because they have been designed and built around the wearers’ needs. So whether you're buying for yourself or your workforce, you can rely on PELTOR to deliver professional protection, and more. You’ll find everything you need from headsets that increase productivity through crystal clear communication to headsets that motivate with music. Connected meets protected. Wearers can work while protecting their hearing and enjoy music at the same time - yet they'll always be in touch. The Headset uses Bluetooth® to connect with mobile phones for hands-free calling, allowing the phone to be answered without interrupting work. Communicating in noisy environments has never been easier – or safer. 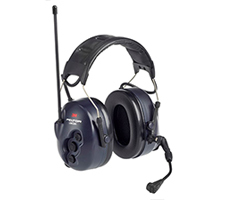 The PELTOR™ LiteCom headset is a tough and rugged headset designed to cope with demanding use in many different working environments. The cord-free two-way radio allows a two-way conversation on up to 8 channels and has a range of up to 3,000 meters. 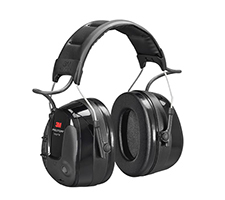 Level dependent function for ambient listening helps you focus on your work and communicate with colleagues in noisy environments without removing the hearing protection. Stereo feedback will allow you to hear and better determine the direction of alarms, warning cries, backing vehicles and so on.